The following technical report was originally published in the Association of Firearm and Tool Mark Examiners Journal, Volume 31 Number 4, Fall 1999. It is being reprinted here with permission of the editor, John M. Collins and the author, Don Mikko. Note: Two illustrations originally published with this article could not be obtained. The author has provided replacement illustrations which can be seen in the article below. America's military is about to lock and load with new ammunition that's tough on enemies but easy on mother earth. It's known as the "Green Bullet", which is a new lead-free projectile that defense officials say is just as lethal as the standard 5.56mm without harming the environment. The Army led effort is designed to one day end the use of environmentally hazardous materials in small-arms munitions for all services. The new round will replace the copper-jacketed lead core with a copper-jacketed tungsten tin or nylon core Military officials hope the program will soothe growing environmental and health concerns that have led to the closing of hundreds of live-fire training sites around the country. Currently, the newly designed ammunition is restricted to small arms caliber's ranging from 9mm to .50 caliber. Engineers at Oak Ridge National Laboratory (ORNL) are using powder metallurgy techniques to produce metal matrix composite simulants for lead. 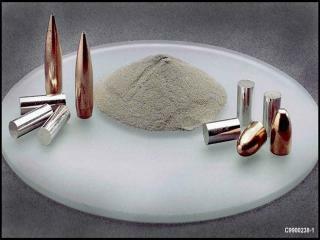 Bullets are being fabricated from mixtures of powdered metals, and/or coated metal powders or particulates that are consolidated to form dense metallic materials. High-density metals such as tungsten are mixed with lighter, softer metals such as tin and zinc to produce components with controlled density and mechanical properties. Powder metal mixtures are simply cold pressed to produce a high-density material. No heat treating or sintering of the composite simulants is necessary to achieve the appropriate properties. The combined processes of mechanical interlocking and "cold-welding" bond the metals together, and can be varied to control the properties of the non-lead core. Bullets can be pressed directly to shape, or cores can be produced that can be swaged into projectiles, with or without jacketing. Processing conditions and composition can be used to control density, i.e. ballistic performance and weapons functionality and impact properties, i.e. penetration and frangibility. The primary goal of the project is the development of functional, high density, non-toxic small arms projectiles with controlled impact behavior, i.e. frangibility, for training and field use. Preliminary results have been achieved using cold pressed mixtures of metal powders. 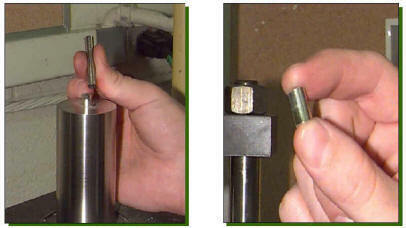 Core materials with densities similar to lead have been fabricated and tested. 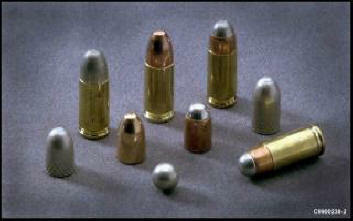 Small caliber bullets including 5.56, 7.62,9mm, .38 and .45 caliber, have been produced employing the same techniques used for the construction of lead-containing bullets. 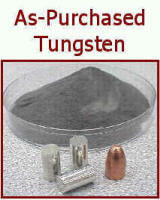 Ammunition was assembled to match current specifications for the given caliber and test fired. Factors such as velocity and accuracy were recorded and found to be similar to those of the lead-containing projectiles. It was also found that terminal performance, i.e. impact properties, could be controlled through selection of materials and processing. An advantage of the powder metallurgy approach for the fabrication of bullets is the ability to vary the properties of the materials over a wide range. The impact properties of the bullet can be controlled through composition, selection of starting materials and processing conditions. The use of wetting agents and coatings has permitted even greater control of the bonding of the materials and thus terminal behavior. Another advantage of the powder metallurgy approach is that the composite core materials are completely recyclable. 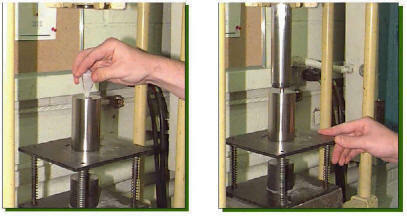 The binder and high-density metals are NOT chemically bound and the binder metal does NOT wet the dense constituent. 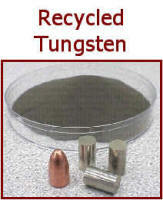 The metals are easily reclaimed from the scrap collected at firing ranges employing simple heat treatments. This will provide a new and less expensive source of raw materials, inevitably lowering cost. In contrast, non-toxic simulants employing polymer binders will have to be burned to reclaim the metals, complicating the ability to cost-effectively reuse the materials. I would like to thank Mr. Rick Lowden for his contributions to this article. Additionally, I would also like to thank SA Carl Kriigel for his photographic expertise. NOTE: The opinions or assertions contained herein are the private views of the author and are not to be construed as official or as reflecting the views of the Department of the Army or the Department of Defense.